Since we’re in January, the time of the year where bad movies go to die (Zero Dark Thirty on the 16th excepted), Daniel will be rolling out a series of retro reviews of some lesser known classic films. He wants to assure everyone that these films will probably be better than watching Texas Chainsaw 3D. Everybody is part of a system, whether they know it or not. This year, Andrew Dominik’s ‘Killing Them Softly‘ was released, showing us a system that was broken. He seized, with perhaps a heavy hand, on the notion that just as the criminal world of the United States can be thrown out of sorts by corruption and rogue elements, so to could the mainstream economic systems of the country. The film is small scale, but it bludgeons with much, and we feel the impact of its thesis throughout. However, the real star of the film is its positively sparkling dialogue. The film is filled with the kind of talk that propels a narrative, even one that largely features guys just sitting around chatting. Now, if the dialogue of that film’s many conversations feels particularly literary it’s because it is actually based on a book, Cogan’s Trade, by George V. Higgins. And if you’re like me, you may be wondering why it took almost 40 years to make another movie based on the work of Higgins; especially after watching the low-life classic, The Friends of Eddie Coyle. 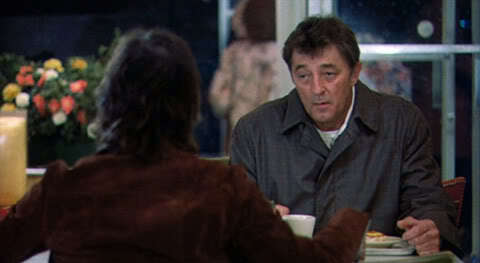 Robert Mitchum talking shop in the Friends of Eddie Coyle. The Friends of Eddie Coyle, directed in 1973 by Peter Yates (of Bullitt fame), is based on Higgins’ first, and best, book of the same title. The story concerns a work-a-day criminal and gunrunner, grinding out his everyday life shuttling between coffee shops, taverns, and the street. Both the novel and film paint a picture of Boston filled with nondescript tough guys and hoodlums trying to get by; it was the anti-flashy response to the baroque tragedy of novels (and films) like The Godfather. The titular friends of Eddie Coyle are not known by anyone outside of the underworld they’ve created for themselves. It’s a shadow universe that has its own unspoken rules and codes of conduct. Despite critical praise, ‘Coyle’ was not a big success upon release and Higgins’ adaptations were abandoned, even after one of his acolytes, Elmore Leonard, saw his Hollywood stock soar. Watching ‘Coyle’ again, it is not hard to see why it failed to incite much passion in audiences. It meanders, it is unglamorous and its one suspenseful, dramatically tense subplot involves largely faceless goons robbing banks in the most well-mannered way possible. And yet, it has a heartbeat, a pulse thrumming through it at a markedly different pace and rhythm. This is almost entirely because of the central performance by Robert Mitchum as Eddie “Fingers” Coyle; a role that steers into the skid of his entire filmic persona. By the time of its release, with most of his career and well-known performances behind him, Mitchum’s anti-flash presence is the axel that keeps the wheel turning on the film. His heavy eyes and tired walk provide a back story for Eddie before we hear word one of Mitchum’s well-known gravelly, sonorous voice. His Eddie, a small time operator and unsung family man, is weary; he’s a criminal, sure, but one that understands and accepts the choices he’s made. He is just trying to make his way in the world, even if it is the underworld. He’ll accept broken fingers as the price of doing business, but with more impending jail time hanging over his head, Eddie is looking for a way out. Yates tackles Higgins’ novel in a style befitting of the characters it contains. It is all low-key and based in an unremarkable reality of diners and train stations, worn looking bars and dim restaurants. The aforementioned subplot involving a gang thieves taking bank managers hostage to extract money from their banks is told in the most matter-of-fact way with little explosive violence or confrontation. Everyone, from the bank employees to the robbers, is accepting of the situation. 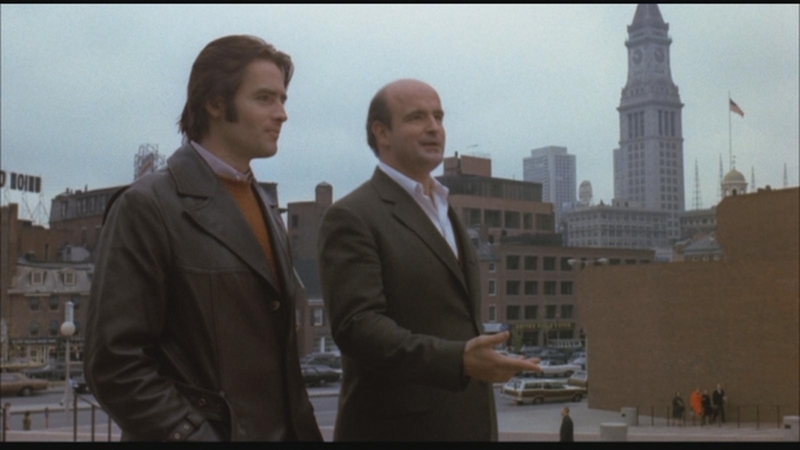 To further this lo-fi feel, ‘Coyle’ eventually introduces us to Dillon, the bartender and part-time hitman played with casual grace by Peter Boyle, Jackie Brown (Steven Keats) as a mouthy arms dealer, and confiding cop Foley (Richard Jordan), who all revolve around and intersect with Eddie in ways he never quite grasps. Like I said, they’re all part of a system. Peter Boyle the great character actor (before the Raymond salad days). In an interview recently with Dominik, he mentioned that it seemed foolish that Hollywood would just abandon any attempts to adapt Higgins’ work, especially when so much of it crackles with dialogue that yearns to be heard. So while Killing Them Softly can be read as an attempt to redress the absence of Higgins in movie theatres, I think it is somewhat fitting that the fate of The Friends of Eddie Coyle remains semi-obscured, lost to time. The film, much like its titular character (and star, in a way), doesn’t have a lot of flare, or dramatic pomp; it tells an unflinching story of one more guy, aging into oblivion, angling just to make a living, ground down by the only system he understands. Heads up: This review appeared first on Ology.com as part of their Film Riot project. To join in the discussion, sign up here!